We made ours with the Funfetti Cake Mix, but I'm sure you could use just about any cake flavor. 3. Scoop out by rounded tablespoons and form into balls. (I'm sure you could make them smaller as well). Place 2 inches apart on a cookie sheet. See, we're not terribly precise with our balls of dough. Flattened slightly with a glass. 5. Bake for 6-8 minutes or until the edges are light golden brown. Ours took a little bit longer, but some were kind of big and my oven's temperature isn't always accurate. Remove from pan and put cookies on a cooling rack. 6. If desired, add a little bit of frosting and sprinkles while the cookies are still warm. Yum! Those look so delicious & simple :) I'll definitely try these, my daughter will love to add the frosting & sprinkles! Thanks for sharing. BTW, I also have a simple cookie recipe that uses a cake mix. 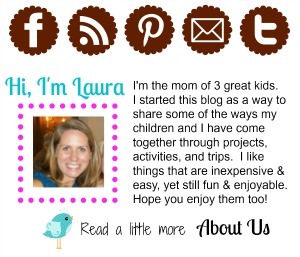 I just discovered your blog about a week ago and i LOVE your ideas and your whole blog! Thank-you for taking the time to share your ideas! My boys are going to love them! Seriously?!! That is awesome! I'm going to have to try this one sometime. Oh my God! I have to try that .... It's soooo easy, as I like. Found you through U Create with Kids! Im a new follower! Ive been reading some of your past posts and you have some genius ideas. 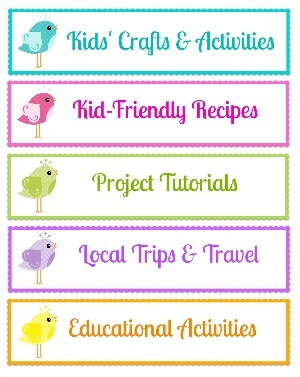 I cant wait to do some of these activities with my kids! I'm not much of a baker either. But, your cookies look delicious. Thanks for linking up with Fun for Kids Friday!